Government bureaucracy, am I right? Armstrong, Aldrin, and Collins get out of their ship after going to the moon, and the first thing they have to do is fill out some pesky customs paperwork. It's a sign of our times, right? Nope—it's an urban legend. 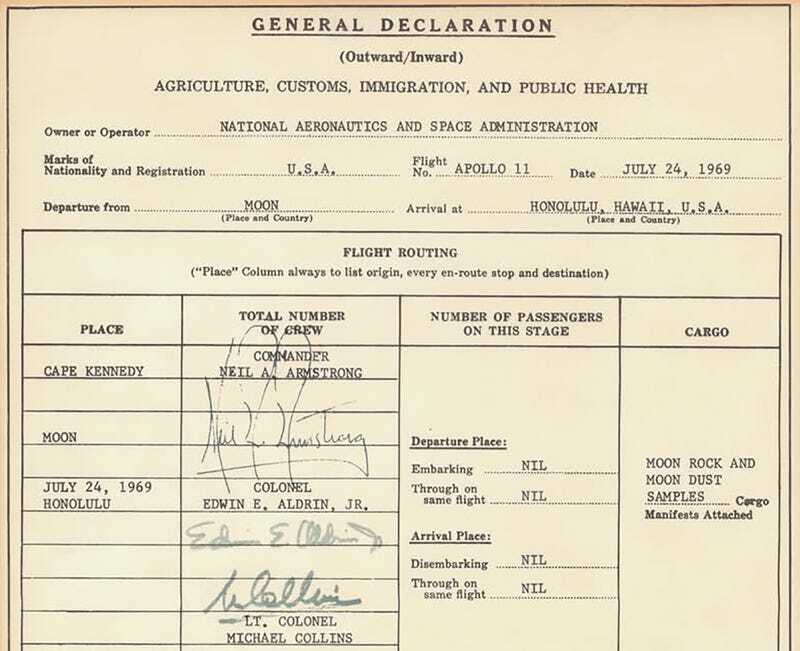 As NASA History explained recently (and as our friends over at io9 first found out), the customs paperwork is indeed real. But the legend that the moon crew's first contact back on earth was with a persnickety customs agent hell-bent on getting the paperwork filed is nothing but a myth. As it turns out, the forms, most likely created by the Customs Service's District Director for Hawaii, were signed by auto-pen weeks later in 1969, when the astronauts were back at NASA headquarters.